Wednesday August 9th, Marty the Psychic will continue her book signing tour at famous Denino's Pizzeria, 524 Port Richmond Ave, SI NY 10302. Marty will be doing a meet & greet and book signing. 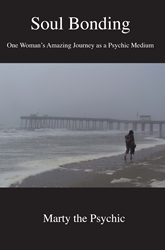 "Marty the Psychic," psychic medium, spiritual healer and forensic intuitive will be coming to The Euphemia Gallery in Spring Lake, New Jersey on Sunday, August 20th from 2:30 to 4:30 for a book signing and "Conversations with Marty." Books on sale at the gallery. Reserve your seat now. Only 20 available. Call for more info. Boulevard Books is an educational publishing company founded in 2010 by author Avi Gvili. It aims to publish the newest voices of the 21st century by empowering authors with ownership of their work.